"This has to be my focus. 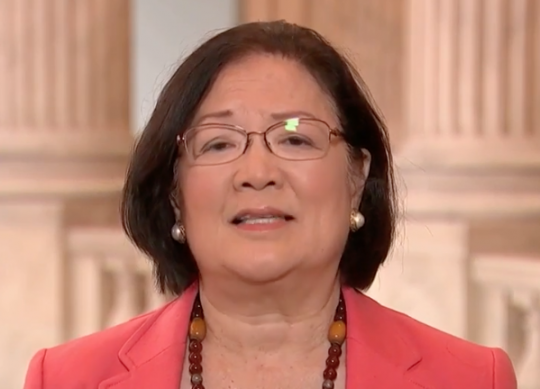 I'm going to continue to prepare and demand a thorough investigation into these claims – and I am going to fight to make sure Dr. Christine Blasey Ford, Deborah Ramirez, and any other woman who courageously steps forward to tell her story isn't smeared by conservatives ready to walk over these credible claims against Kavanaugh," Hirono wrote. "What that means is I have limited time to campaign for our re-election or to fundraise – making us particularly vulnerable to right-wing attacks. So, while I'm focused on stopping Kavanaugh's nomination and finding the truth, I'm asking you to step up now and ensure my team in Hawaii has everything they need to win our campaign in November. Can I count on you?" Hirono added. About an hour later, Hirono sent a followup email apologizing for the "error" of sending the fundraising email. "A fundraising message was sent this morning in error. We apologize sincerely for the error. All contributions made on this page will be donated to organizations helping survivors of sexual assault," the email read. This isn't the first time Democratic senators have tried–intentionally or not–to fundraise off resistance to Kavanaugh. Sens. Kamala Harris (D., Calif.) and Cory Booker (D., N.J.) used their roles in the confirmation hearings to fundraise for their political campaigns. 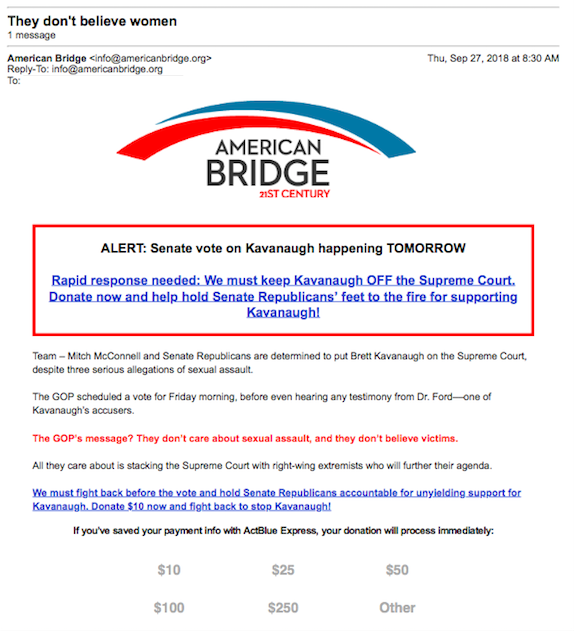 American Bridge, a Democratic opposition research firm, also sent out a fundraising letter on Thursday with the subject line, "They don't believe women," referring to Senate Republicans. This entry was posted in Politics and tagged Brett Kavanaugh, Cory Booker, Kamala Harris, Mazie Hirono, Supreme Court. Bookmark the permalink.